Our Versailles 2 day tour in Deluxe package is dedicated to those who wants to get the best of Versailles with the minimum effort. Get a private car for the transfer from Paris to Versailles, 4-star hotel in walking distance of the Palace and full skip-the-line entrance to the Versailles Palace will get you started. Enjoy with a private guide the best things the Palace has to offer : the mirrors gallery, the Garden and it’s fountains, the grand canal and Marie-Antoinette’s estate. Then start discovering the cutest town around Paris: Versailles, its amazing food markets, its country-side looks and perfect relaxing atmosphere. Along with Versailles’ great must-see landmarks, our guides throw in fun moments, best shops, best cafés, or for kids a boat ride or bike’s. 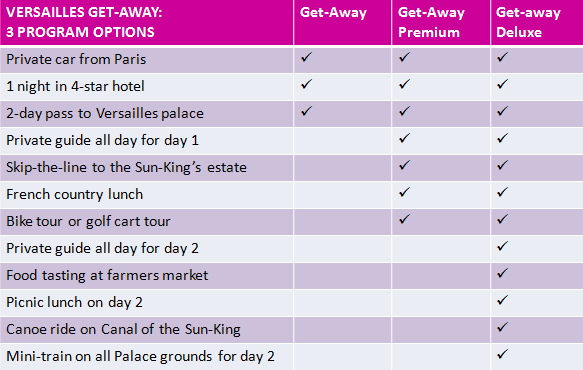 Check out option Get Away and Get Away Premium and pick the one you prefer ! A private car will pick you up in the morning of your first day to bring your to Versailles from any central Paris location. Our Versailles tour is available all year long. This is the perfect weekend break, with 4-star hotel, private guide, full skip-the-line entrance to Versailles and your private guide on both days. •	skip-the-line entrance in the Estate of the Sun-King: Hall of Mirrors, King’s apartment etc. unlimited 2 day-pass for the Palace of Versailles, private-car drive to Versailles from central Paris, accommodation in 4-star le Versailles hotel, with full breakfast. Tour does not include: food and entrances unless specified, gratuity for guide (optional).